New year, new blogging. I had some great sessions in schools last year, and feedback from my CPD workshops suggested that teachers really appreciated a bit more depth on each of the Tech Trumps®. With that in mind I'm resurrecting my Friday Focus series, and this week I've gone for the powerful, collaborative and beautifully designed Trello. What better way to start the new year than with a planning tool! Trello bills itself as a visual collaboration tool, and what that means in practice is that you use three visual tools in the form of boards, lists and cards (in that order) to manage your tasks. There are lots of formating and display options, and it's also super easy to collaborate with others. Boards are the top level, think of them as a kind of online whiteboard. Next down are lists, and you can have several of these on each board. Finally you get individual cards on each list - this is where you put the tasks you're working on. Boards can be personal, team based or public, and individual cards can be assigned to specific people and given deadlines, labels and other aspects to help you manage them. Everything can be commented on, which can be great for feedback and assessment, and all activity is tracked and displayed so you keep on top of progress. Trello is particularly strong on Collaborating and Planning, so let's look at those two aspects in particular. 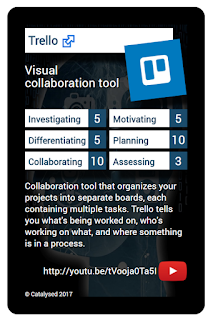 The collaboration side of Trello is very powerful, and you'll undoubtedly use it as some point with colleagues, but personally I'd recommend it primarily for your students rather than for you. After all, we know that getting students to work with each other is a powerful way of helping them to see other perspectives and develop a deeper understanding of a topic. Collaboration can be challenging though in terms of some pupils not pulling their weight, and leaving the bulk of the tasks to others. Trello can help here by not only scaffolding the completion of tasks, so removing the barriers that might hold some students back, but also by revealing individual contributions to a group project over time, and hence catalysing peers to motivate each other. From a planning perspective Trello would be an excellent tool for problem based learning, as the challenge of organising themselves in these scenarios can be too much for some students, but personally I would recommend it as more of a personal planning tool. It can be excellent in helping you map out your own plans for teaching in multiple time frames. You might set up a board for a weeks or a fortnights teaching, for example, sketching out what you intend for each day for each class in a simple to use format, and perhaps sharing that with other teachers you work with, teaching assistants or other school staff who need to know what you have in mind. Alternatively, you could create a board for a wider curriculum you're working on, adding in different ideas as and when you come across interesting and useful new material, perhaps sharing with other colleagues from your department in order to create a diverse set of resources. So that's about it for Trello - an intuitive and simple way of managing tasks, both individual and collaborative, easy to use but with powerful tools to ensure that tasks are progressed and individual activities are easy to perceive. Do you have any ideas for using Trello that you'd like to share? Please feel free to add them in the comments! 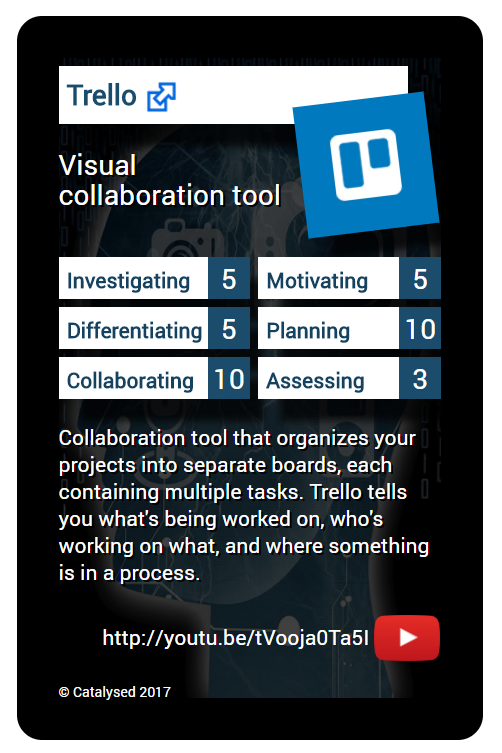 Do head over to the Tech Trumps® to see Trello and a host of other apps, all rated against the key challenges you're focused on as a teacher. There's an interactive version of the Tech Trumps® to explore - or you can go old school, and buy a physical pack of cards for only £8.99 plus postage, which I'll whisk off to you first class in the next available post. As ever, if there's anything in particular you'd like me to cover here please let me know in the comments. See you next Friday!